Clothing has played an important role in my life, no doubt in yours too. Clothing is not just something to keep us warm in winter and to cover us for modesty. It can also be used as a powerful tool in which we can tell the world who we are, without even saying a single word. There is often a deeper layer of connection that is formed with our clothes. A dress might remind you of a special moment in time, perhaps when you first met your now husband. Or that jacket you HAD to get which gave you the confidence to nail the interview for your dream job. These pieces might hang unworn in your wardrobe but they still hold a special place in your heart and in your memories. As one of the ambassadors for the Clothing Exchange’s next swap ‘What She Swaps’ in July, I thought it would be fun to share with you a story of one of my most cherished wardrobe pieces. Which will be up for the taking at their swap on Thursday, July the 5th at the Meat Market in North Melbourne at 6:00 PM. Let me tell you the story about Madam Rose Tours…. This garment holds a very special memory for me. A bright pastel pink tailored jacket, with black grosgrain bow detailing on the pockets and slightly gathered sleeves. As you can imagine this jacket makes quite a statement! It was a beautiful spring afternoon, and I was eagerly awaiting the arrival of my dear cousin Ma Lou and her partner Oli who were visiting from Belgium. I, unbeknown to them was on a secret mission… to convince them to move to Melbourne for selfish reasons as I wanted them to live close by so I could see them more often. My cunning plan was to show them how awesome this city is thus making their decision of moving a no brainier. This BTW wasn’t totally one sided …they had expressed interest in moving countries, I was just helping them to make the right decision. Image by Oli & Ma Lou. I chose the most iconic meeting place, Flinders Street station under the clock for our rendezvous. I was unmissable in the pastel pink jacket. Ma Lou, Oli and I, all united with a huge hug and the typical flurry of French kisses on each cheek. Meaning what a funny colour, it’s pink isn’t it? The name suited the occasion perfectly and I decided to fully embody this new title… and so begun Madam Rose tours. Ma Lou and Nadia at Federation Square. Taking this new role to heart, I lead the way as most tour leaders do marching out in front. Pointing out monument and telling them interesting facts, trying to woo them with my city. Immediately Ma Lou and Oli looked at each other with almost telepathic unison, “we’ve got this” they said whilst running over to the stall to sign up for the contest. The challenge was simple, one team member had to throw a pancake from their frying pan and the other team mate had to catch it into their pan. With each successful catch, both members had to take a step back away from each other. Gradually increasing the distance apart from one another until only one team is left standing. Almost instantly, 10 teams assembled at the starting line and with a loud whistle the games had begun. Ma Lou and Oli where leading the way, masterfully flipping the pancakes through the air to one another with ease and grace. I have to say it was quite a magical sight, seeing so many pancakes dancing in the air in sync to the music of contestant’s voices shrieking with victory with each successful catch or groaning in disappointment on their failed attempts, watching helplessly as their pancakes missed and fell to the floor. Pancake flipping competition, Federation Square. Images Oli & Ma Lou. Ma Lou and Oli were still in the lead, battling it out with the rest of the competition. Until… I couldn’t believe it, they were the last entrants left standing. They won the International Pancake Flipping Competition. Yippee! They gladly accepted their delicious prize and needless to say it was quickly gobbled up. Seeing their triumphant looks, I pondered to myself- how do you top a sugar high? I decided to show them what Melbourne is best know for, our amazing international cuisine. We headed down to China Town. The red wooden gates glowed bright and welcoming with the reflection of neon lights. Walking along the busy street, restaurant hawkers flagged us down, calling out to convince us to dine at their venue. We powered through, bowing our heads to these venders with an expression that read ‘thanks but no thanks’ until we approached a dark and badly lit arcade, we had reached our destination… China Red. I made a beeline across the top half of the restaurant and headed straight down the stairs into the underbelly of the venue with my small tour group in tow. We were shown to our seats, a comfortable brown booth. Immediately Oli noticed something different about this restaurant compared to any other he had been too. 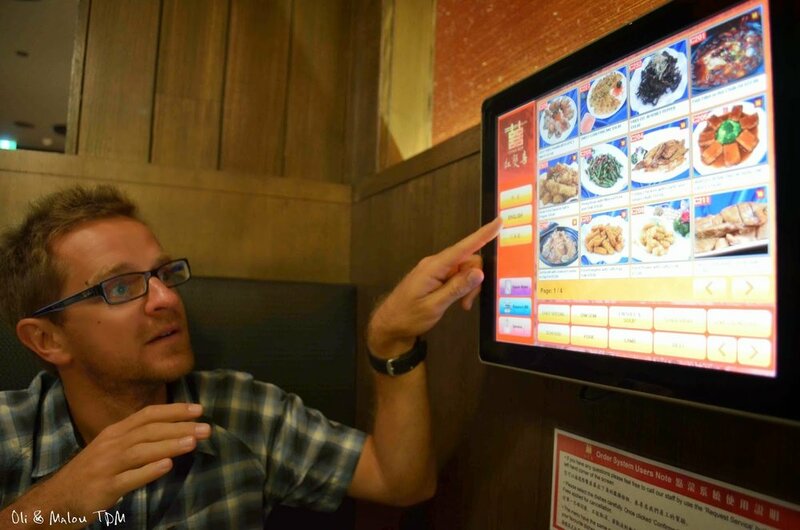 Oli excited to order food via touch screen at China Red. I nodded with a smile, “this is where the magic happens”, I said pointing to what he and Ma Lou were now looking at. Oli’s face lit up as he started touching the computer screen on the wall. Flicking through the extensive menu which showcased all of their delicious delicacies. As good Chinese food is quite hard to come by in Belgium, we went a little bit overboard and ordered WAY too much food. We tried pretty much every type of dumpling they had, pan fried, steamed, in chili oil, xiao long bao, dumplings with prawn and with vegetables. We ordered bok choy with hoisin sauce, soft shell crab, tofu and eggplant clay pots and rice to soak up all the delightful flavours. By the time we finished our meals, we were completely stuffed and unable to move. But also very satisfied with our little food babies that had emerged! With dinner a success, I could see that my plan was working. They were falling in love with Melbourne thanks to our food scene which was scoring major points with them. I thought to myself, “Time to step it up a notch, I’m going to wow them with our nightlife!”. Since they are both scientists, where better to take them than the iconic Croft Institute!? We slowly pulled ourselves off the couches and made our way towards the next destination, taking a side step to check out the graffiti art along the way. We arrived at the venue and were faced with a horrendously long queue. I could see the disappointment slowly creeping into their eyes. Like a lightbulb an idea struck me. “Follow me guys”, to which I’m sure I had a crazed look about me. “I’ve got this”. I charged to the front of the line, approaching the bouncer with them diligently following closely behind. “Good evening sir”, I said with my best British accent. (side note: I still don’t even know why I thought this was a good idea- and have never done this before or since this evening.) “I am from Madam Rose Tours, I am here with international delegates to showcase Melbourne’s best bars”. “Madam Rose tours, huh!? The bouncer said. “Never heard of them”. Adjusting my suit and standing proudly I continued “Oh, I am quite surprised.” I acted shocked. “I am the founder of Madam Rose tours, it is a pleasure to meet you sir.” Pausing for effect “I believe there was a reservation made for this fine venue for our special delegates… may we come in?”. He looked at me and the so-called delegates carefully. “Delegates, huh” he started. “well… if you’re looking for Melbourne’s best bar, you have come to the right place.” He turned to the door lady and signalled to her to allow us to go through. “go on through”. He nodded. “Thank you, kind sir”, I said, almost powerwalking inside to hide the façade of my confidence evaporating and accent breaking. “Phew, we actually made it! Shanking my head and exhaling with relief. “Wow that was awesome”, exclaimed Oli. “Yeah, thank you Madam Rose” Ma Lou sung with glee. Ma Lou shot me a strange look. Siringe spike drinks at the Croft Institute. We lined up at the bar and ordered the drinks, then spent the rest of the evening dancing the night away. A great finish to the perfect day. Fast forward 4 years later, I am sad to report that Ma Lou and Oli didn’t end up moving to Melbourne- they chose the U.K instead. And it was I who ended up moving across the globe to join them so we could share the famous grey weather of London. That jacket has been quietly sitting in my wardrobe since then and whenever, I look at it, I am immediately transported back to that memory. I wonder if that evening would have turned out the same way if I didn’t have that jacket? Which gave me the confidence to become Madam Rose. I feel that now is the right time to pass on it’s magic to someone else. The question is, where will this jacket take you? For tickets to the Clothing Exchange "What She Swaps" event on Thursday the 5th July click here.